The online landscape is changing, and I see many local companies that stick to “traditional” notions of what websites should be. I also am seeing a lot of digital marketing solutions are getting left behind that could easily help company’s websites get a lot of traffic. Companies often miss a lot of things in their digital strategy, especially when it comes to on-page optimization and content. Some of these elements may seem small or insignificant, but they could make a huge difference in visibility when integrated and implemented properly. I’ll be compiling a list of the top 10 digital elements that local websites lack to help you identify areas for improvement in your own digital campaign. Here are the first five. Title tags are the second most important element of on-page optimization. Your page’s title tag appears at the top of users’ browsers, and Google uses as the anchor text for your link on its results pages. ABS-CBN News is one of the few local websites that uses title tags well. Your page’s title tags should include the title of the page itself and any applicable keywords, and the name of your brand. The ideal formats for title tags are “Primary Keyword – Secondary Keyword | Brand Name”, or “Brand Name | Primary Keyword and Secondary Keyword”. Formatting and writing your title tags correctly tells users what your link is about and who your company is, which can increase its trust signals and encourage them to click on your link. Meta descriptions provide short explanations of what a webpage is about. Search engines use these to generate the descriptive snippets that appear beneath links in results pages. If you don’t optimize these descriptions, Google will generate them based on your website’s content. BPI’s website doesn’t have meta descriptions, so Google generates a description for their pages automatically. The resulting descriptions don’t provide a lot of information about their page’s content. Users are more likely to click on your links if their descriptions are clear and informative. It’s surprising how many local news and magazine websites don’t have authorship markups on their websites. Authorship markups allow Google to display author information in search results. This includes the author’s name, Google+ link, and photo. Some of Rappler’s pages have authorship information, but some don’t. They would gain better readership and online visibility if they implemented it consistently across all their pages. Search results that include this information have higher click through rates and better visibility than those that don’t. Authorship also increases the authority of your website, and builds trust with your target audience. There are so many designers offering free and paid website themes that there’s really no excuse for having a bland design. Many local companies don’t realize that investing in a pre-made theme and customizing it for their brand can help them build a great website in less time and with less effort. 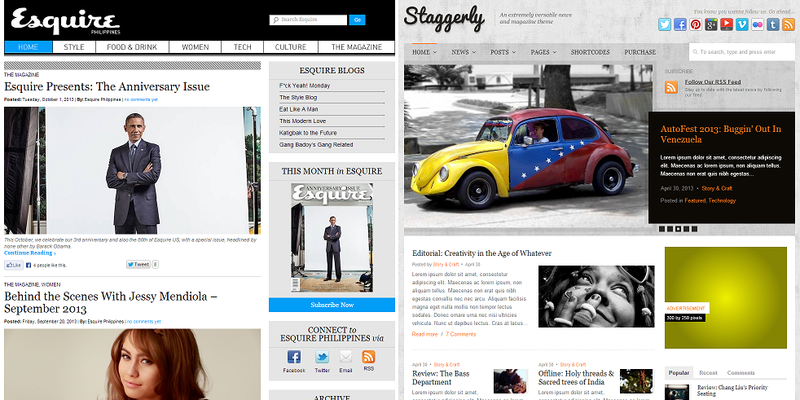 The Esquire Philippines website could look even better with a pre-made theme from websites like themeforest. Nurturing leads through e-newsletters is an important strategy for any business, but a lot of local companies haven’t included it in their online campaigns. A well-written and perfectly timed newsletter can drive more traffic to your website, increase social signals, and generate more responses for offers or subscriptions. 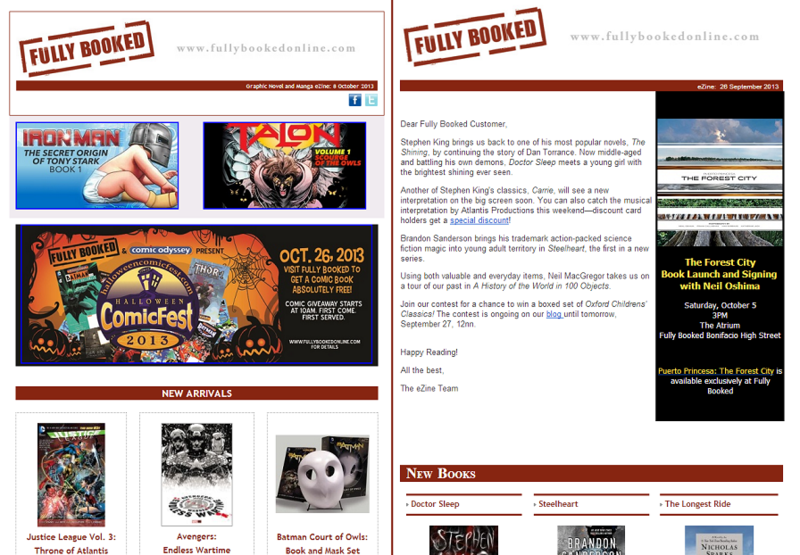 Fully Booked makes good use of newsletters and marketing segments by providing six different newsletters based on their customers’ genre preferences. These newsletters include information on new products, popular products, and events. Other companies would do well to follow their example. This is part 1 in a 2-part series to help large companies figure out what they can do to improve their online campaigns. If you’re missing any of the items listed here, you could be missing out on a lot of opportunities. Contact us and let us show you how to develop a robust and effective digital strategy.